[Jeremy’s movie] was shot in black and white. And much of it was set in various homeless encampments around Palo Alto. There was an encampment in the hills, and another along San Francisquito Creek. The film’s characters were a rough group of survivors. Old school homeless, like Eddie, were joined by younger characters who were former employees of Silicon Valley’s big tech companies, and other startups; who had been thrown out on their ears when they reached age forty; and found themselves living in a futuristic economy with no support system. 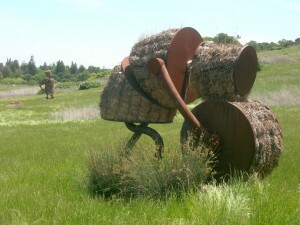 Makin’ Hay, by Tom Otterness, at the Stanford Dish….